So … it’s been about a year since I posted these the first time. I just made them again, (March, 2015) and I can’t get over them. Let’s review my cheesecake recipe list…. Cheesecake Cupcakes?-Check. Cheesecake Stuffed Strawberries?- Check. Chocolate Chip Cheesecake Brownies?- Check. Butter Pecan Cheesecake Squares?- Check. Cheesecake Sugar Cookies? -Yup. So, you get the point. Me likes my cheesecake. And one day I decided to try to freeze little balls of it. Because if I don’t find a way to properly portion cheesecake… I’m in big trouble. These are my favorite in the summer. Anytime I want a bite of cheesecake, I just skip to the freezer (yup, skip… if it’s for cheesecake, I’m skipping.) and there it is. I’m not saying I always stick to one… or two… or three… but at least the option is there, right? That’s gotta be worth something. What’s your favorite way to eat Cheesecake? …Perhaps just in its natural form? Is it weird that I’ve never actually made just a normal cheesecake? Well anyhoo. If you don’t have strawberries, that’s okay. You can still make this- just ditch the strawberries. Although if you ask me, strawberries and cheesecake go just as well as chocolate and peanut butter. MMMM-MM! 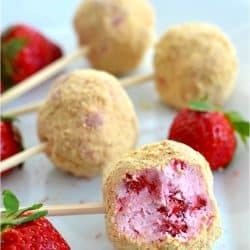 These deliciously creamy No-bake Strawberry Cheesecake pops are SO tasty- great for any occasion and freezable until ready to serve. Break frozen mixture a bit with a spoon and let sit for about 10 minutes. Take small handfuls and roll into balls (the shape doesn't have to be perfect at all, we can fix these later) Set them aside and place them in the freezer in groups as you go. Pour graham crack crumbs on a plate. Remove cheesecake balls from freezer (in groups). Perfect the balls a bit, clean your hands, and one by one, cover them generously with graham cracker crumbs. Have your hands full of crumbs as you cover them. As you do so, perfect the shape of the balls and place them in a container to freeze as you finish each one. Another good recipe of cheesecake. What’s even better is its a no-bake cheesecake. And strawberries are just perfect. Wonderful recipe! Looks so good… I’m wondering about adding some Nutella? I am planning a graduation party. How long can they be non refrigerated? Hi Norma! So I did a little experiment last night, since I had some in my freezer! 🙂 I let it sit out to see when it would start to get less sturdy on the stick. It was 77 degrees in the house and it was good for a solid 30 minutes. So if they’re kept indoors around a similar temperature, that will help you gauge! 🙂 They taste so good, I hope you have a chance to try them- thanks for asking! Hi.. I made these pops as one of my sweet dishes for my husband’s birthday. Topped them with frozen strawberry rings. They are melt in the mouth. Amazing. Thank u.
Hi Farida! What a great idea for a birthday party- I’m sooo glad you enjoyed them. These are DEFINITELY mouth watering 😉 I always have a stash in my freezer so I can have one whenever I feel like it-which is right now since we’re talking about it! 😉 Thank you for letting me know, it made my day! Hi Stephanie! I am going to try to make a couple bathes of these for my husbands holiday party at work. I was wondering, after being made they must be put in the freezer, right? Well he goes into work very early in the morning and I am sure the pot luck wont be until the afternoon, so how long do you think these should be taken out of the freezer before served so they aren’t frozen when being bitten into? I see that you responded to another person saying they are sturdy for about 30 mins after being taken out of the freezer, but how long for them to thaw before serving is my question? Thanks! Also, considering the nutella addition in one batch, how many scoops of this would you guess? And would I just add it to all the ingredients in the beginning? I actually wouldn’t suggest letting these thaw all the way before serving them because then they will fall off the stick 🙁 So I would stick to putting them out around the 30 minute mark. They’ll be chilled enough to stay on the stick- but not frozen solid. Thanks a ton, Stephanie! And thanks for responding! 30 minutes sound great, I guess my concern was that people would bite into frozen solid pops if they ate them right away, bu if they are able to be eaten right away and not be too hard then I agree, I see no reason to let them thaw. Thanks again so much, I am REALLY excited to make these! These were a hit! Thanks Again! Is it possible to make this in a cheesecake pie form? Like just follow directions, but place in spring-form pan and refrigerate for 4 hrs instead of freezing? What do you think? So I’m curious if after freezing these they could be dipped in chocolate then sprinkled with graham cracker crumbs? 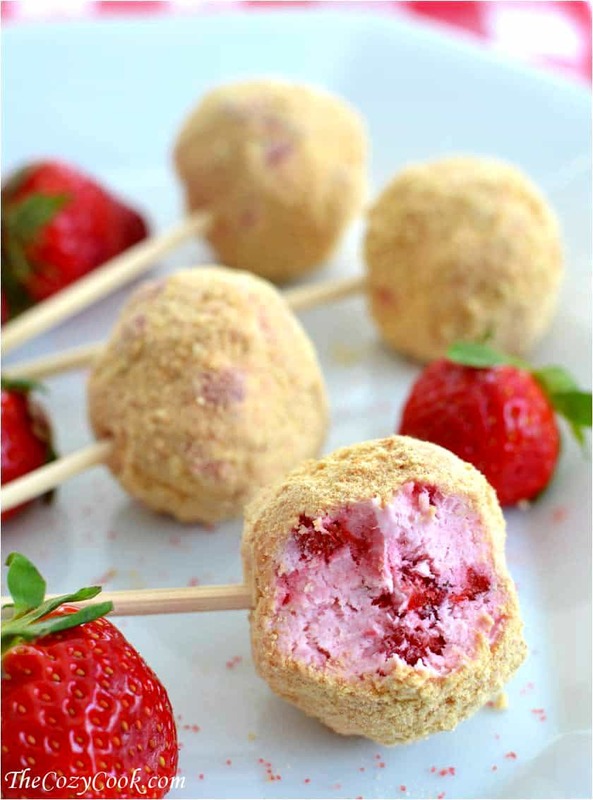 I want to make a strawberry cheesecake chocolate covered cake pop topped with graham crumbs. Do you think it would be possible? Would they have to remain frozen after dipped in chocolate? Would refrigeration suffice? These sound amazing! Hi Shae!! I would definitely say that they should stay in the freezer, unfortunately- but your idea sounds absolutely delicious, they should be a BIG hit!!! 🙂 Enjoy!!!! It says to add sour cream but the recipe doesen’t call fpr sour cream. I’m in the middle of making it and stumped! I can’t believe no one noticed this. Everyone seems to have made it anyway and loves it, but I don’t dare go any further. Help!! Hi Paula! I’m so sorry about that. I had to transfer my recipes from an older format to a new one and in doing so for this recipe, part of the ingredients got cut off. I’ve update it 🙁 I’m so sorry about that, and thank you for letting me know! these were tangy, how can i fix that? Adding slightly less sour cream should help for next time!